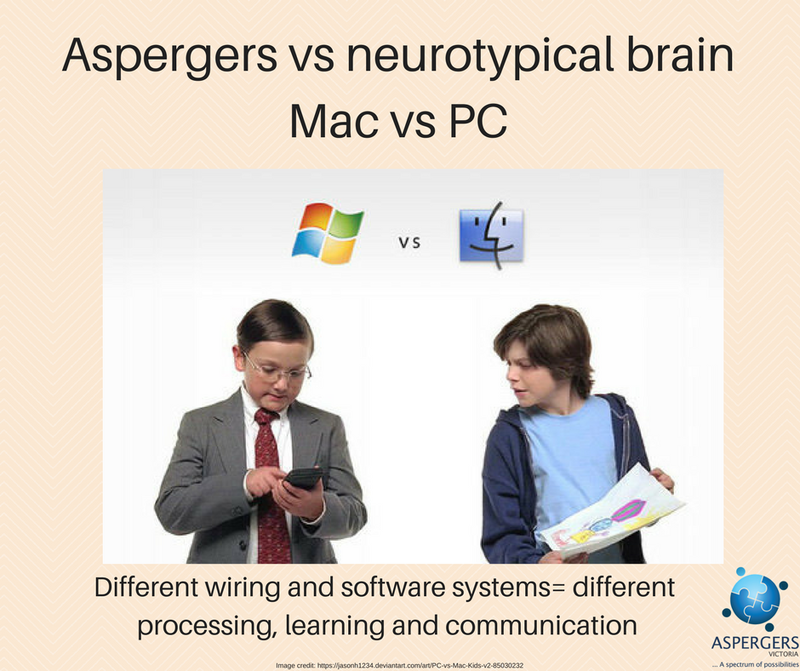 Aspergers is a neurology that affects the way we communicate, and is considered to be part of the autism spectrum. This difference in thinking influences the way we make sense of the world, process information, relate to other people, and cope with various situations. People with Aspergers minds have average or above average IQ, and many people with Asperger traits don’t feel ‘disabled’, just different. It is how they are treated in the world that can disable them. When we meet someone we are unconsciously assessing their social cues including their body language, the expression on their face and their voice, so we can respond appropriately. People with Aspergers can sometimes find it hard to read social signals that others might take for granted. Some people describe this as not having the innate ability to understand and respond to social cues, so social glitches tend to occur. While people with ASC and Aspergers may seem quite introverted and even ‘blank’, the truth is that there is a busy internal world that isn’t visible. Variations in the neurology of our brains like this mean that many of us perceive the world differently from the way others do. This is a part of "neurodiversity". Minds with ADHD, ADD, dyslexia are also part of neurodiversity. Asperger brains have a lot more going on processing our senses, which make colours, sounds, smells and feelings seem brighter, louder and stronger than for Neurotypical (NT). The 'spectrum' is a term used because the variations in autism neurology affects people in many different ways and degrees. People with Aspergers are often processing additional detail around them and have great skills in detail observation and order. Our approach at Aspergers Victoria is to build on strengths which then support challenges. An Aspergers analytic brain can learn strategies for managing difficulties - with the right approach. Each person with Aspergers is an individual with their own mix of traits, culture, personality and more - Aspergers does not necessarily define them. However, some of us with stronger Asperger traits tend to find it more difficult to interact with others which, without support, can lead to social anxiety and isolation. People with Aspergers can learn communication and social ways, and may also have strong talents and abilities in other areas too, such as science or the arts. Many famous inventors, authors and artists are now considered to have had Aspergers such as Einstein, Aristotle, and Mozart. Many people with Aspergers are proud to call themselves ‘Aspie’. With the right support, strength-based strategies and encouragement, neurodiverse people can thrive. On the other hand misunderstanding, unrealistic expectations and lack of adjustment in their environments, can result in distress for the person with Aspergers, as well as for others. The extent to which Aspergers shapes an individual’s life and experiences is highly variable and can change. Children have varying degrees of difficulty at school and at home, and adults have varying degrees of difficulty with independent living, employment or with relationships at home. Misunderstanding, unrealistic expectations and pressure to communicate or participate beyond our ability can trigger sensory overload, anxiety and meltdowns. Knowledge of Aspergers, and appropriate individualised support are more available now, including through Aspergers Victoria, so that many of the challenges experienced by people can be managed. Peer support and understanding made possible by the information and support offered by Aspergers Victoria can make an important difference for many individuals and families. With understanding of their individual strengths and challenges, support networks, encouragement and good communication, children and adults with Aspergers can thrive. Peer support groups offer a fantastic way to learn more and find a community of people to rally behind you. Independent, unique thinking - People with Aspergers tend to like to spend a lot of time alone, teamwork is often a challenge and peer pressure may not be as influential. As Tony Attwood says “The person usually has a strong desire to seek knowledge, truth and perfection with a different set of priorities than would be expected with other people…the person values being creative rather than co-operative.”  Allowing time for a balance between independent versus group activity is appreciated. Visual, three-dimensional thinking - Some are visual thinkers, which lends itself to useful and creative applications, but auditory information may not be retained, so information in visual form is helpful. Logic versus emotion – A particularly logical approach to problem solving is a strength, however solving a problem can be the overriding priority rather than satisfying the social or emotional needs of others. Guidance may be needed on how to manage and express emotions, which at times can be overpowering and cause meltdowns. Importance of routines and rules - To try and make the world less confusing and stressful and to minimise change, people with Aspergers may follow particular rules, rituals and timetables. As a result, they may be perceived as very conscientious, and having a strong sense of justice, however an unexpected change or delay can cause a great deal of anxiety. Advanced notice and concrete concise explanations of the need for changes and allowance for adjustment time is helpful. Strong particular interests - People with Aspergers may have an intense, at times obsessive, interest in a topic, hobby, or collecting, which can evolve or remain fixed. Some people are exceptionally knowledgeable in their specialised interest. With encouragement to build on this strength, these interests and skills can evolve into a course of study or work in their area of expertise. For example, a particularly good physical endurance can translate into a great sporting talent, probably in a non-team sport. Focus and diligence - The Aspie ability to focus on tasks or things of interest for long periods without interruption is highly valued. With motivation to focus on a particular task such as a sport or music, comes diligence and persistence, and this practice builds strong talents. However this particular focus can be a distraction, so strategies for refocusing on other priorities may be needed. Attention to detail - Some people see or recall errors or details at a glance, so quality control is a strength. However this approach can be seen as pedantic and perfectionistic and without reminders the “big picture”can become lost. Memory – Some people have great long-term memory but not so good short-term memory. For example, memory of exact details, especially for visual material or events or in a particular field of interest may be particularly good. However people’s names may be forgotten, objects such as car keys may be misplaced, or when solving problems reminders may be needed of relevant facts. Higher fluid intelligence – Some people have a higher fluid intelligence, that is, the ability to find meaning in confusion and solve new problems, to draw inferences and understand the relationships of various concepts, independent of acquired knowledge. People with Aspergers have average or higher than average IQ. Honesty and loyalty – People with Asperger type personalities tend to demonstrate these valued and appreciated qualities to a high degree, but Aspies are also known for being very direct (blunt even) and speaking their mind. They can also be very literal; so can have difficulty initially understanding jokes, metaphor and sarcasm. They are unlikely to be social manipulators. Political resilience – People with strong Asperger traits enjoy being alone and tend not to be swayed by peer pressure to change their views. Sensory sensitivity - Some people have an intense sensory sensitivity. These can occur in one or all of the senses: sight, sound, smell, touch, taste, body awareness and balance, and the degree of sensitivity varies for individuals. Most commonly, an individual's senses are either intensified (hypersensitive) or underdeveloped (hyposensitive), for example: bright lights, noises or smells may be overpowering; and some food textures may cause anxiety and pain. People with sensory sensitivity may also find it hard to use their body awareness system and carry out 'fine motor' tasks such as tying shoelaces. This sensitivity can also assist and hone their creative talents, for example in music with perfect pitch. Using earplugs or sunglasses, for example, can help avoid sensory overload. According to the criteria preferred by many researchers, about 1 in 250 children is diagnosed with Aspergers, and about the same number again have not received a diagnosis . In comparison, around 1 in 80 people have a diagnosis of Autism. Aspergers is currently diagnosed about 4 times more often in younger boys than in girls - however this ratio reduces after teens. The reasons for this are unknown but are considered to be possibly due to girls’ capacity to mimic social skills and the limitations of current assessment tools. Since the term Aspergers was removed from American medical terminology in 2013 Australian health professionals and the community continue to use this term as a meaningful way to describe challenges experienced by many people with Asperger traits so their specific needs and support are more easily identified. An increasing number of children are receiving a diagnosis of Aspergers or High Functioning Autism. A school teacher or parent might be the first person to identify difficulties a child is having at school or at home as being related to Asperger type personality traits. Adults are also increasingly recognised as having Aspergers, sometimes following the diagnosis of their child or recognition of these traits by their spouse. A parent of a young adult may identify difficulties at home as being related to these traits in their adult child. Some young adults experience difficulties with social isolation, and also need help to increase their independent living skills and become less dependent on their parents. For some adults with undiagnosed Asperger traits, difficulties first become apparent when they have difficulties adapting to becoming a parent themselves, or they experience difficulties sustaining spousal relationships. A spouse may identify difficulties at home as being related to Asperger type personality traits of their partner. Recognition and understanding of Asperger personality traits in a child or an adult can be a welcome revelation for family members as well as for the individual themselves. Significant misunderstanding and stress can be relieved and help can be obtained to communicate more effectively with family members and others including friends, teachers and employers. Undertaking formal Aspergers assessment with a health professional can help with accessing services, but learning new skills for everyone involved can make the biggest difference – learning new communication skills and gaining understanding of Asperger type personality traits. An increasing number of children and adults are being recognized as having significant Asperger traits, for an adult sometimes this follows diagnosis of their son or daughter or recognition of Asperger personality traits by their spouse. As a result, the term Aspergers is understood to reflect the diversity of individual neurology and personality in our community. Undertaking formal Aspergers assessment with a health professional can help with accessing services, but gaining understanding and learning new communication skills for everyone involved can make the biggest difference. People with Aspergers do not usually have learning disabilities as experienced by people with autism, but they may experience specific learning difficulties such as dyslexia, attention deficit hyperactivity disorder (ADHD) or epilepsy. Sometimes people may receive a diagnosis of autism spectrum disorder (ASD) or high-functioning autism (HFA), instead of Aspergers. However, people who have been given these diagnoses will have similar difficulties and similar support needs to those diagnosed with Aspergers. Our professional directory lists a range of professionals who may be able to assist you with your diagnosis journey. As knowledge and understanding of Aspergers improves and support services continue to develop, people with Aspergers have a greater opportunity to reach their individual potential. Support groups, information sharing, events and other services such as those offered by Aspergers Victoria are known to help mental health and support the development of social skills, providing links to others who understand, as well as providing information and peer support for family members. There are many helpful approaches, therapies, and strategies, which improve an individual's experience, for those with Asperger traits, with or without a diagnosis. Knowledge and understanding together with appropriate communication skills, advice and a network of support make an important difference for everyone involved, including family members, friends, teachers, and employers with mentors and encouragement essential. 1. Attwood, T., The Complete Guide to Asperger's Syndrome. 2006: Jessica Kingsley Publishers. 2. AANE Asperger/Autism Network, What is Asperger Syndrome? 2014.